Are you looking for a chocolate treat that is sure to impress friends and family? I love making bark for special occasions because it’s delicious and easy-to-make. 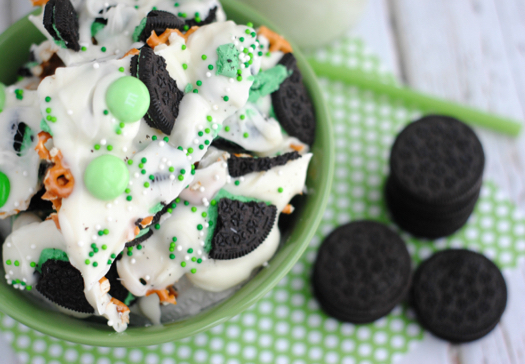 This Saint Patrick’s Day themed white chocolate bark includes mint M&M’s, mint Oreo cookies, pretzel pieces and sprinkles. 1. Line a 9×13 baking sheet with wax paper or foil. 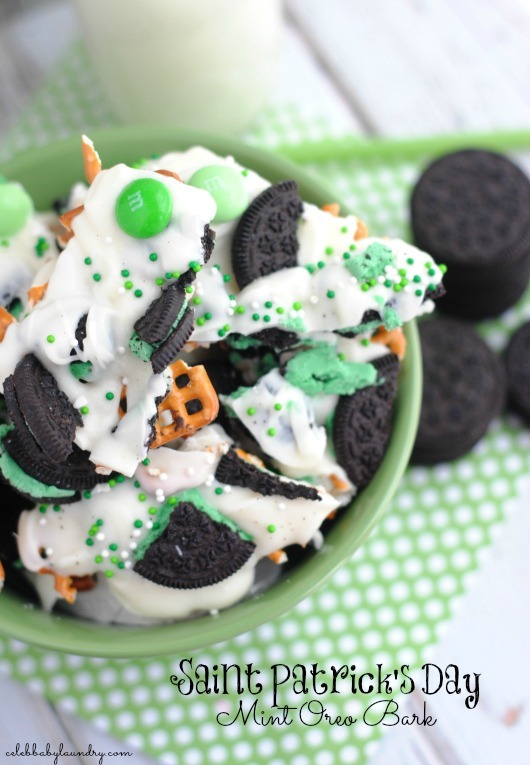 Spread 3/4 cup of the mint M&M’s, roughly half of the broken Oreo’s and all of the broken pretzel pieces onto the lined cookie sheet. 2. Melt the chocolate in a microwave safe dish stirring every 30 seconds until melted. Let cool 1-2 minutes. 3. Poor the melted chocolate evenly over the M&M, Oreo and pretzel mixture. Spread out with a spatula if needed. 5. Remove from the fridge and break into smaller pieces.